Added the Sold transaction as an event for each serial number's history. 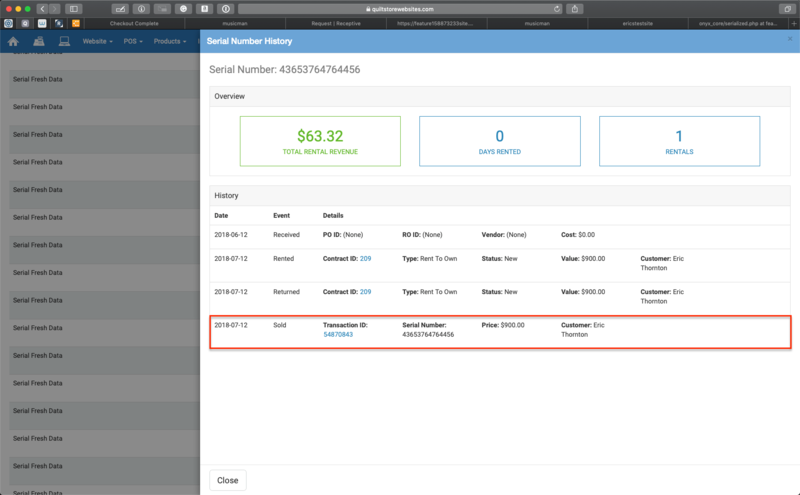 We made the transaction ID clickable so the merchant can quickly see the transaction view. Previously the transaction was linked with the serial number, but didn't show in the history. Updated the web cart so that the shipping methods based on weight or price do not take digital downloads, classes, or RTO contracts into account for the shipping method pricing. Updated transactions created through the register where Shipping is applied so that they include the same user interface as a normal web order. Previously they didn't have the same full options as standard web orders when viewed from Products > Orders. Made some updates to the dashboard so that data shown is more accurate. Fixed an issue with style/option products where spaces could be saved at the beginning and end of the style Value which caused that style to no longer display on the web. It now removes those extra spaces. Example: Previously, it was possible to save a color Option or Size (e.g. Red or Medium) with a space in front of the word, but that will now correct itself. - Fixed an issue where in certain cases, on the first load of the register, classes were not properly being taxed. - Fixed an issue where every time a new item was scanned at the register, you would hear two beep sounds instead of a single beep. Fixed an issue where layaways wouldn't be properly marked as 'Picked Up' and would still display a remaining balance. Made it so the Manage Pricing panel shows up during the initial product creation. Previously the product had to be saved once to see the panel.